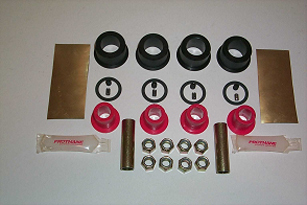 It was necessary to introduce these repair kits to satisfy owners who have experienced unusual composite spring front bushing wear characteristics with MGA DESIGN 2 and MGB DESIGNS 3, 4 or 5 as outlined further on in this article. It would appear that the rear shackle eye design is satisfactory, therefore, no upgrades are being considered at this time. In regard to the above, we have looked into the cause(s) of these conditions, and concluded that lateral movement of the rear axle assembly is the primary cause for both of these problems. This movement is further exaggerated through aggressive driver techniques. Of a secondary nature, during the composite spring installation process, we have always indicated the importance of deburring and smoothing the inner surfaces of the front spring mounting abutments. I am not too sure exactly how many installers bother to take notice of this point. I would like to point out that we have always, as outlined in the appropriate technical article(s), recommended the installation of a panhard rod assembly (MGB tube axles only) to compliment the installation of composite springs. When installed, this component virtually eliminates the lateral rear axle movement as outlined above. 2 - .565" OD x .447" ID x 2" (MGA) Insert tubes. NOTE: To carry out this operation, it is not necessary to remove the entire composite spring assembly from the vehicle. 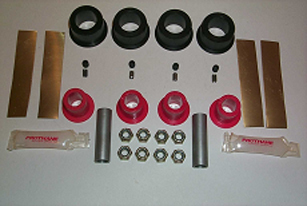 However, if the split shouldered Delrin bushings have not been further secured within their respective front eyes, or if the Delrin bushings need to be replaced, we highly recommend their removal. Further information follows in this article. To allow for full rear axle defection, in all probability, it will be necessary to remove the rear section of the exhaust system. Upon assembly be sure to liberally coat all bushings, tubes and hardware with the supplied lubricant. This includes the rear spring shackle as well. During installation, do not overtighten hardware. Final tightening should be carried out with vehicle on the ground, ramps or such. 1. Jack up vehicle and place axle stands slightly forward of the front spring mounting abutment. 2. Lower vehicle down until the axle is supported by the axle check straps. 4. Remove rear section of exhaust. 5. Raise rear axle and remove axle check straps. 6. Lower rear axle to allow for full axle deflection. 7. Working with one side only, reposition jack to one side of the axle tube, and support. 8. Remove both the shackle pin assembly and front spring eye hardware. 9. Lower jack until front spring eye is clear of mounting abutment. 10. Remove old polyurethane bushings and tube. Install new bushings and tube. 11. Re-install both the shackle pin assembly and front spring eye hardware. 12. Position jack to the other side of the axle tube, and continue with same. Reverse operations 1 thru 12.
drive set screws. Use either drill bit #3 (.213") or 7/32" (.2187"). of 1/4" SAE x 5/16" Allen drive set screws, or 3/16" x 5/16" split roll pins. NOTE: The above kit, part number MAJOR/KITA, is applicable to both DESIGN 1 & DESIGN 2. 4 - .0625" split shouldered Delrin support bushings. 4 - 1/4" SAE x 5/16" Allen drive set screws. 4 - 3/16" x 5/16" Split roll pins. 4 - Replacement polyurethane insert bushings. 4 - .007" Brass shim stock. 2 - .565" OD x .447" ID x 2" Insert tubes. 8- 3/8" SAE grade 8 nyloc nuts. 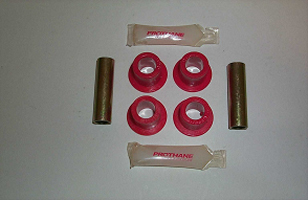 2 - Prothane Teflon lube tubes. The following instructions should be read in conjunction with the appropriate section of the MGA workshop manual covering rear road spring replacement. 1 - Remove any securing hardware as indicated in DESIGN 1 or DESIGN 2 above. polyurethane insert bushings, from the spring eye. them out of the spring eye. 4 - If fitted, remove existing brass shim stock .007" from within the spring eye. inner surface must be smooth before installing new bushings. 6 - Trial fit new bushings within the spring eye. completely through the Delrin bushings. #3 (.213") or 7/32" (.2187") drill bit. Using 1/4" SAE (28 TPI) tap, tap all the way through the Delrin bushings. 9 - Apply loctite to the new set screws and install. 11 Drive in new roll pins until flush with outer spring eye surface. assembly, apply supplied lubricant liberally. Measure 3/8" in from either side of the underside of the spring eye, that is the side facing the ground, center punch location and use 1/16" pilot drill followed by 3/16" drill. Remember to drill all the way through the Delrin bushings. Drive in supplied 3/16" x 5/16" split roll pins until flush with the outer spring eye surface. 4 - Fiber spacer washers 7/8" ID x 1.3/16" OD x 031" thick. 2 - .565" OD x .447" ID x 2.1/8" Insert tubes. 8 - 3/8" SAE grade 8 nyloc nuts. DESIGN 1…… OEM silent block bushing. DESIGN 2…… Split polyurethane bushings with 7/8" OD pin. DESIGN 3…… Split .125" shouldered Delrin bushings with 7/8" OD pin. NOTE: We are unable to match a particular design with a designated composite spring identification number. The following instructions should be read in conjunction with the appropriate section of the MGB workshop manual covering rear road spring replacement. DESIGN 1 …. This OEM bushing was secured within the spring front eye with epoxy and, possibly with additional hardware. NOTE: The replacement polyurethane bushing (Moss Motors 267-525) has a larger OD than the OEM bushing, therefore, this type of bushing can not be retrofitted. 1… If fitted, remove the 1/4" SAE x 5/16" Allen drive set screws. 2… Press out the old OEM silent block bushings. .007" shim stock as you proceed. (.213") or 7/32" (.2187") drill bit, followed by a 1/4" SAE (28 TPI) tap. 6… Apply a small amount of locktite to the new setscrews, and install. NOTE: The next instruction only applies if no additional hardware was used, on the spring eye, to secure the OEM bushing. 1….On the underside of the spring eye, mark and center punch 2 locations, 3/8" in from either edge of the spring eye. 2… Using 1/16" pilot drill bit, drill all the way through the spring eye, brass shim stock (if fitted) and Delrin bushing. Follow this up with a 3/16" drill bit. 3… Insert 3/16" stainless steel roll pins. Tap into the spring eye until level with the spring eye surface. polyurethane bushings to force them out of the spring eye. inner surface must be smooth before installing new split Delrin bushings. 3 …. Trial fit new Delrin bushings within the spring eye. from either edge of the spring eye. (if fitted) and Delrin Bushing Follow this up with a 3/16" drill bit. shackle assembly, apply supplied lubricant liberally. NOTE: Please follow earlier instructions as found under the heading "MGA INSTALLATION INSTRUCTIONS (MAJOR)"
To thoroughly familiarize yourself with the technical information contained in this article, I recommend the text be read several times.